I never thought a tea tasting would find me wandering the dark and ironic hallways of the uber-hip (or was it hip 5 years ago? Clearly I'm not hip) Ace hotel, but that's where I met Tony Tellin to taste a generous helping of Smith teas. When asked what I wanted to focus on, I requested oolong. 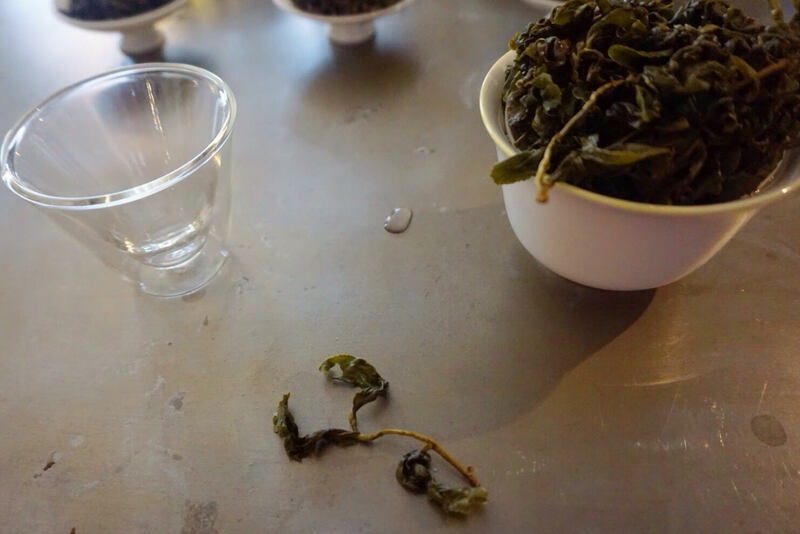 We tasted satisfying oolongs moving from the greener end to more roasted. I watched as Tony worked magic on the leaves. Their No. 80 Ali Shan was buttery, floral, and sweet. The Ti Kwan Yin was a nice example of a classic tea. The Bai Hao was peachy sweet, and a little bit spicy. We then went to Da Jing, a yancha from Wuyi that of course tasted of the soil and rocks. Tasting all of these oolongs one after the other was an educational experience. Comparing and contrasting the appearance and flavor of the leaves based on where they are grown and how they are processed is the best way to learn. It is all about tasting, tasting, and more tasting. 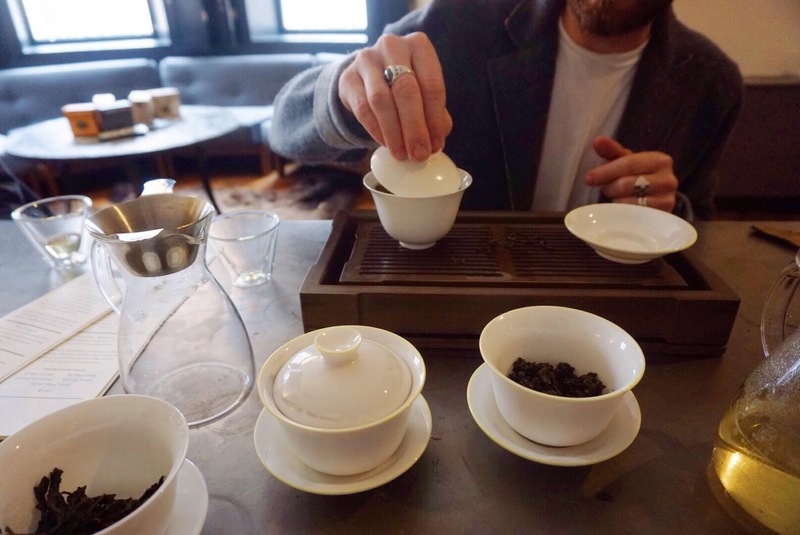 Between sips Tony mentioned Smith now provides gaiwan service at their tasting rooms. I love this, as you get to interact with the tea and dive into the leaves. 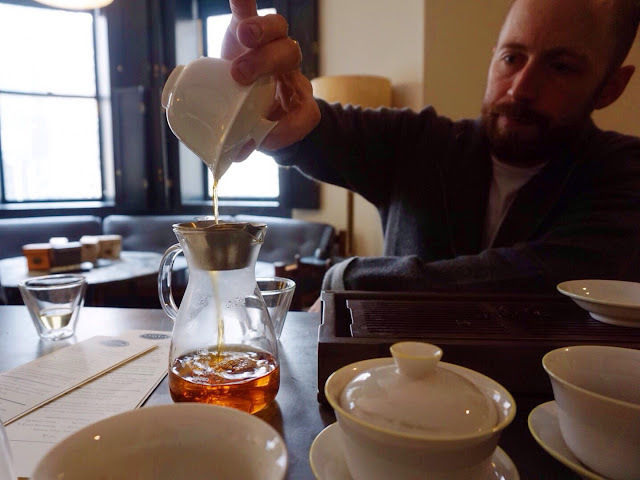 We talked a little bit about how much tea to put into the gaiwan. When I'm at home I usually put enough to cover the bottom of the bowl, often about 2/3 of the cup.Tony's gaiwan tip: if after a few steeps the lid isn't starting to lift up from the expanding leaves (like in the photo below), you needed more leaves. 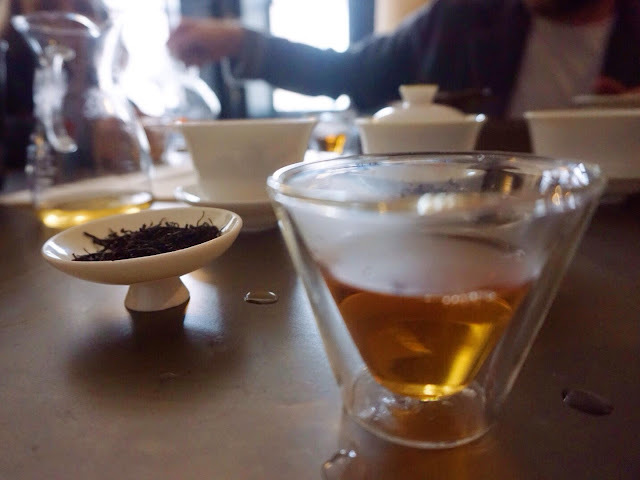 Next we moved to darker teas like Zheng Shan Xiao Zhong (Lapsang Souchong). The farmer growing this tea said the area was the original source for lapsang souchong in the Wuyi mountains. This garden has been making the tea for 300 years. The story goes that the passing Chinese army laid right onto the picked tea leaves to rest, and ruined the tea by accident. The horrified family tried to save the leaves by smoking them. This tea had a scotch-like quality, not the strong campfire experience many Lapsang Souchong teas give. It's a little leathery, and quite delicious. Next was a black Mao Feng from Zhejang province. I loved this tea, the thin wiry leaves created a chocolatey and slightly bitter brew. When I tasted it, I was transported to my mother's kitchen, watching her take brownies out of the oven. The tea is reminiscent of crackly burnt brownie edges still warm from the pan. After all of this, we still kept going! Since I was enjoying the black teas, we tasted Portlad Breakfast. I have a few favorite Breakfast teas, and they happen to be British imports. I've enjoyed other Breakfast blends in the past, but this one really grabbed my attention. It has more nuance than I'm used to. It turns out the difference is in the addition of aged puerh. The tea was a little spicy, smooth with a rich leathery flavor. 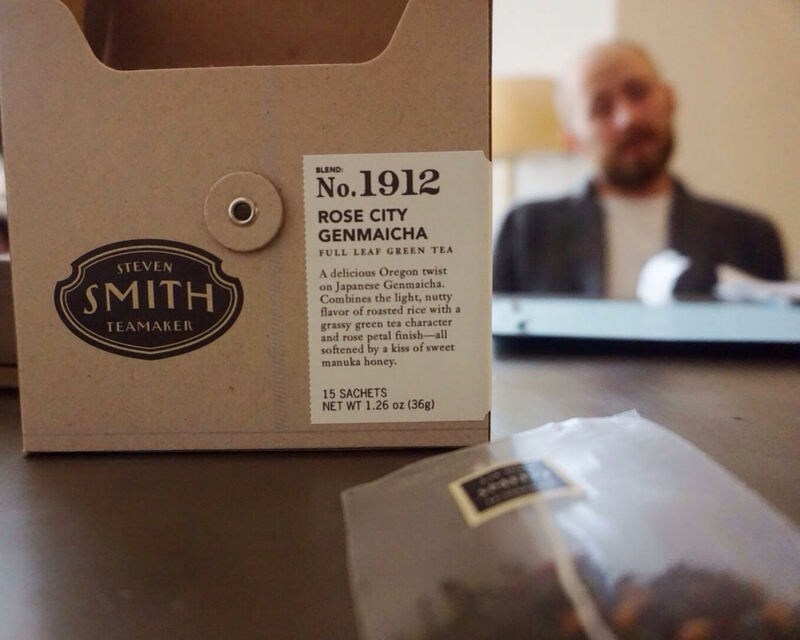 We started winding down a bit and I tried the Rose City Genmaicha. 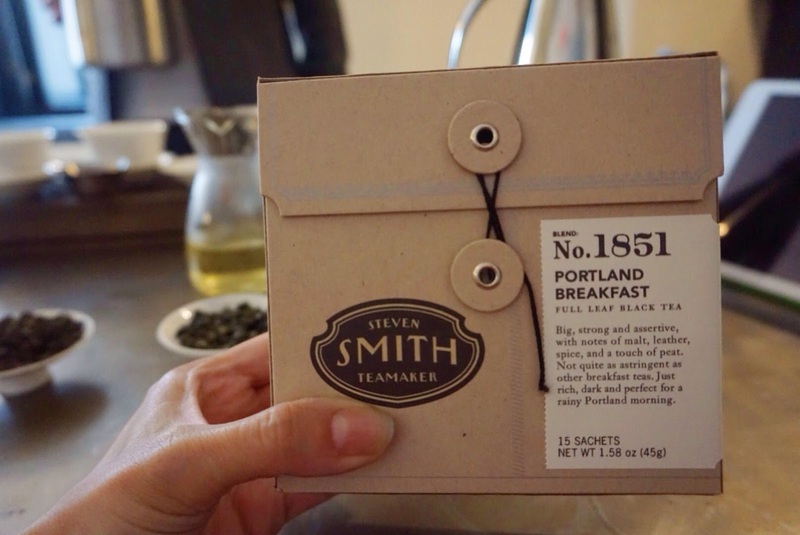 The blends I've had from Smith all have an interesting little twist, and this tea is no exception. I took a sniff of the teabag and said 'bergamot? I could imagine adding mellow fuzzy rose petals to soothing genmaicha, but bergamot? 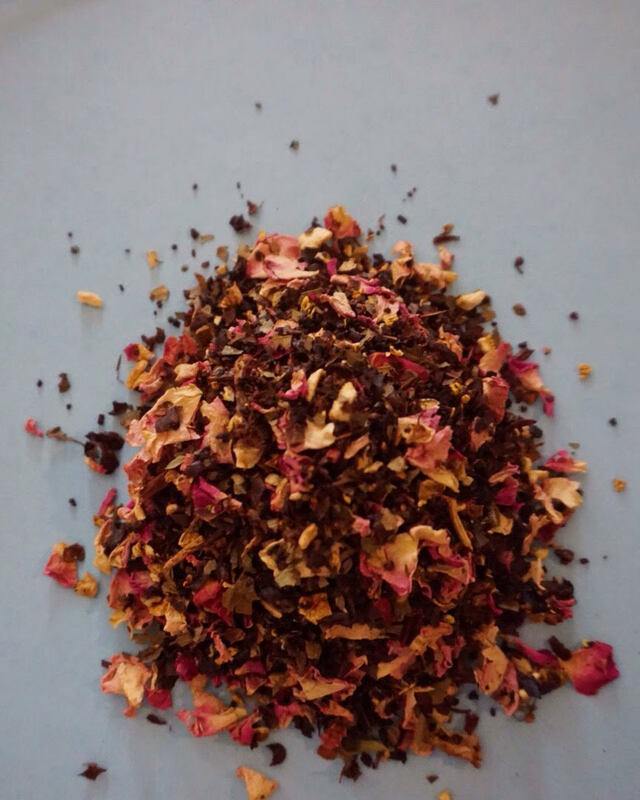 If you follow this blog you'll know I'm not usually a fan of bergamot in Earl Grey. But I was able to appreciate that it adds a little something extra to the blend. It gives the mellow brew a bit of pizzazz. 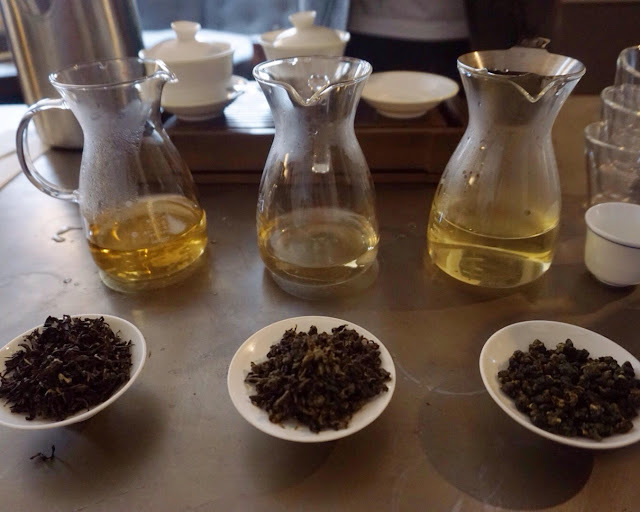 As you can see, it was quite the whirlwind tea tasting. The opportunity to relax, sip, and talk tea with someone I respect as much as Tony was a rare treat. Afterwards I meandered out into the grey on grey hallway, a little tea drunk and quite satisfied. A coffee cherry blend? A Wuyi? Smith now carrying Tong Mu Lapsang?! Tony's been holding out on me. A great experience all around. Excellent tea with a well respected tea maker. I was drooling at the mention of all those oolongs. The Portland Breakfast would definitely be a major step up from my current breakfast blend.